I am ever so excited to announce that I've finally finished FIVE new postcard designs in my etsy shop. I am really happy with these new designs, and and eager to share them with you all now. First, we have the Zesty French postman postcard. This charming vintage-style French postman will bring zest to any mailbox he visits! Meta mail, anyone? He's got a bag full of letters - and he's offering a wax-sealed letter to you! 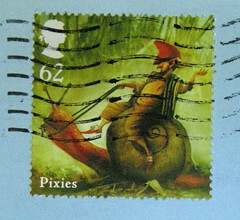 Vintage-style French postage and a French mailbox grace the top of the design above the quote. 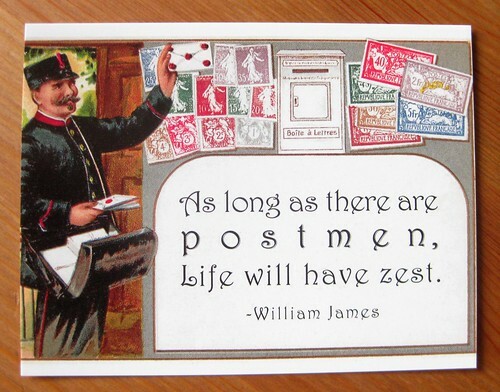 The quote reads: "As long as there are postmen, life will have zest. - William James"
A lovely vintage graphic of a woman writing letters with a dip pen graces this stylish postcard. 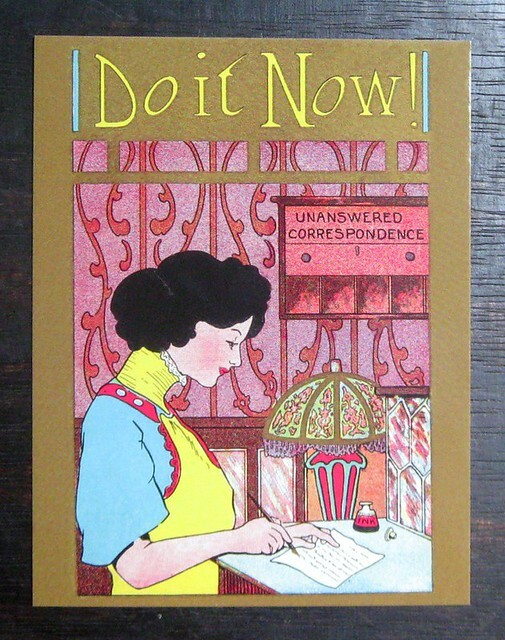 Her mail sorter is labeled "UNANSWERED CORRESPONDENCE" and the text at the top encourages "DO IT NOW!" I get inspired to write just by looking at this. Doesn't it just make you want to pick up a pen and send some mail? Hopefully it will inspire anyone to whom you send it to do the same. The colors on this one are even brighter in real life, if you can believe it... I think of this as almost Victorian day-glo. This design features a vintage graphics collage with a graceful flying swallow. The lovely bird bears an air mail banner, flying high above its day-glo lakeside garden, with an envelope gracing the corner - what's a mail enthusiast not to love about this postcard set? 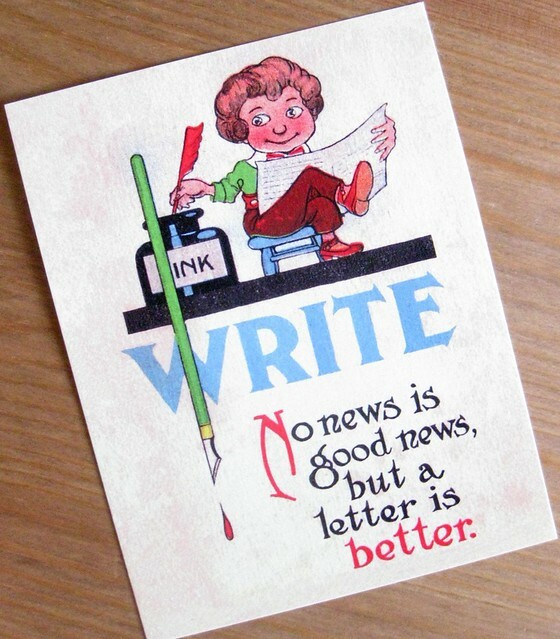 but a letter is better." Last but not least, a matching Letterbird postcard to coordinate with my existing Letterbird sticker seals. Via airmail, via letterbird - par avian, anyone? 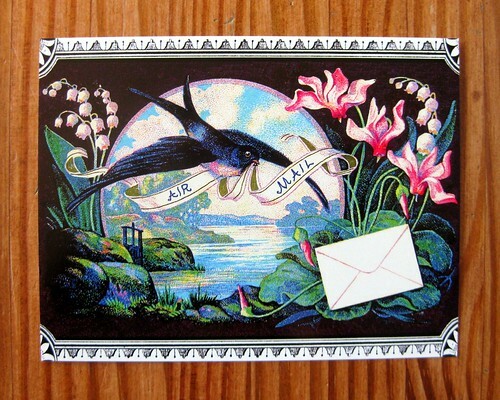 This vintage-style swallow brings a new twist to airmail as it carries an envelope in its beak - and the envelope in its beak is sealed with red sealing wax and a sprig of flowers. 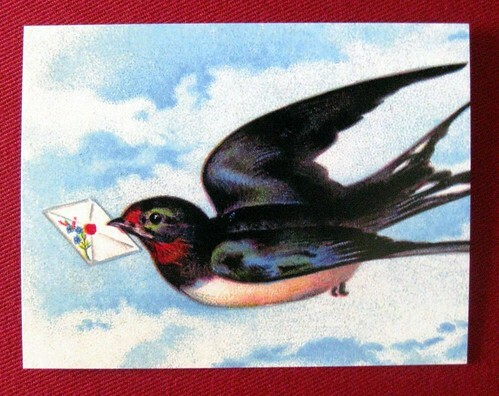 The swallow is swishing through a blue sky with clouds, as I sometimes fancifully imagine my letters flying on their journeys... the bird presenting the envelope in its beak captures the excitement of the letter it seals. I hope you all love these images as much as I do... and if you really love them, consider visiting my etsy shop and picking up some for yourself. If you want a variety, I also sell Combo packs of 5 postcards, and you can choose any combination of designs you like. Have a great mail weekend, everyone! Agreed. Your designs are lovely. Will be ordering soon! I spread a mail art call for a friend who s really bad this days. The theme is The music from every countries and every eras. Every Mail will get an answer. Perhaps some of my readers will be into this.